LAHORE, March 13: Former Pakistan Bar Council chairman Ali Ahmad Kurd said on Thursday lawyers were willing to give President Pervez Musharraf a `safe exit’. “Gen Musharraf should sneak out of the country in the dark of night or 160 million people will be after him,” Mr Kurd said while addressing the Lahore Bar Association (LBA). He said if Gen Musharraf’s `brainless’ advisers believed they could get a stay order from courts against the Bhurbon accord, they were mistaken because, what he said, the judges appointed under the Nov 3 Proclamation of Constitution Order (PCO) had no guts to deliver such a verdict in the face of the lawyers’ movement. Mr Kurd, who is popular among lawyers for his fiery speeches, visited Lahore for the first time he was released after a four-month detention since Nov 3. Lawyers accorded him a tumultuous reception outside the Civil Courts upon his arrival there. The barroom was filled to capacity. Mr Kurd warned if “handpicked” judges tried to hinder the restoration of judges by issuing a stay order against, the masses would hold them accountable. He praised lawyers for keeping the movement alive for over a year, saying that lawyers could continue the movement for another 10 years if judges were not restored. 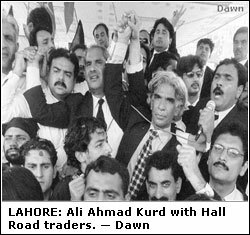 Mr Kurd also led a rally held in connection with the ‘black flag week’ which was attended by LBA and LHCBA lawyers, political and rights activists, students and traders on The Mall. Prominent among them were workers of the Pakistan Tehrik-i-Insaaf, Jamaat-i-Islami, Khaksar Tehrik, Academic Staff Association of the Punjab University and the Labour Party. 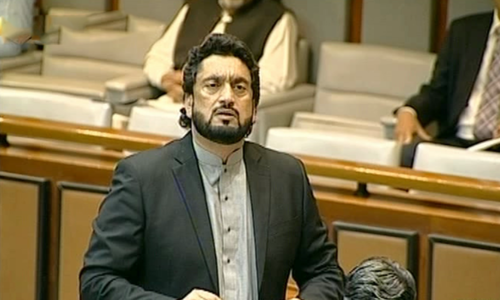 Addressing the lawyers, LHCBA President Anwar Kamal said parliament should restore the judges on a priority basis as it was the demand of lawyers, traders, students and people from all walks of life. LHCBA Secretary Rana Asadullah said political parties must not forget that they got a heavy mandate because of lawyers' struggle for the independence of the judiciary. Lawyers also offered funeral in absentia for Lahore blast victims at Regal Chowk. Earlier, speakers addressing the LHCBA house said deposed chief justice Iftikhar Mohammad Chaudhry had buried the doctrine of necessity when he refused to bow before Gen Musharraf on March 9, 2007. They said lawyers stood up against the worst-ever assault on the judiciary, and were observing the black flag week on the completion of one year of their movement. They endorsed the Bhurbon accord between the Pakistan People’s Party and the Pakistan Muslim League-Nawaz for the restoration of judges. Mr Kamal said lawyers should maintain unity in the face of conspiracies being hatched by the establishment. He added the lawyers' movement would soon shake off dictatorship and usher in an independent judiciary and a strong parliament.